How do you know the difference between a suspicious spot on your skin that could be the early signs of skin cancer, and those little beauty marks you've had your whole life? The way that doctors have been trained to spot it is to remember a simple ABCD acronym: Asymmetry, border irregularity, colour variation and diameter greater than 6mm. Researchers are proposing that an E should be added to the equation – for “evolving.” After looking at dozens of past studies that included 30 subjects or more, authors of a new report found that 88% of patients noted an evolution of their melanoma before it was removed. We’ve been led to believe that if we slather on sunscreen, we’re safe from skin cancer. But this connection doesn’t quite add up, considering that our use of sunscreen has skyrocketed in recent years and the incidence of skin cancer hasn't abated. In fact, some experts believe that sunscreen might actually be contributing to increasing skin cancer rates by offering a false sense of security and keeping people from looking toward better protection. Keep reading to find out how you can get protection from skin cancer from your diet. A study showed a 40% risk reduction in those participants who ate the most fish. It also showed that alcohol consumption might increase risk, as well as high consumption of polyunsaturated fats. The study also concluded that antioxidants such as beta-carotene and vitamin E, as well as zinc and iron warranted further investigation as possible skin cancer protectors. To get the benefits of these nutrients, eat your veggies, beans and lentils, fish, nuts, eggs, seeds and wholegrains. 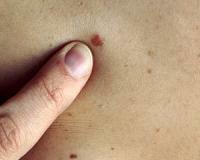 So keep an eye on any skin spots – and apply the ABCD and E test to them. Don’t hesitate for a minute to get a suspicious spot checked out by your dermatologist since early detection makes such a big difference in treatment and outcome.